Wassail is an enchanting holiday beverage with spiced, citrus, and fruit flavors, but this delicious drink offers more than “warm your soul” goodness. Wassail is based on an ancient custom of celebrating life, friends and family, and upcoming harvests. Sipping warm mugs of spiced Beet Wassail with friends and family while gathered around a crackling fire equals the perfect Fall and Winter bliss! Let’s go a-wassailing! If you celebrate Christmas, you may be familiar with the Christmas carol, “Here we come a-wassailing.” This song contains catchy lyrics referring to “wassailing” or singing carols from door to door wishing good health to others. Wassail, an Anglo-Saxon phrase which means “be you hale” (“good health” or “be healthful”), is a hot mulled cider-like beverage traditionally made with various ingredients, such as roasted apples, cloves, ginger, nutmeg, sugar, curdled cream, and even eggs. Originally, it was custom for wassail to be served in a “wassailing” bowl as guests and carolers were invited inside to escape the cold and to enjoy a warm beverage and fellowship. Drinking old-fashioned wassail during the holidays is a family tradition. Introduced to me by my fabulous cousin Angel, wassail is made every year and shared with family and friends during chilly Wisconsin winter months. Traditional wassail is filled with delightful fruit juices and spices, and the extraordinary beetroot pairs beautifully with apple, pineapple, and orange juices. Adding naturally sweet beet juice to the family recipe creates a twist on a classic holiday spiced drink. Plus - the color is gorgeous! 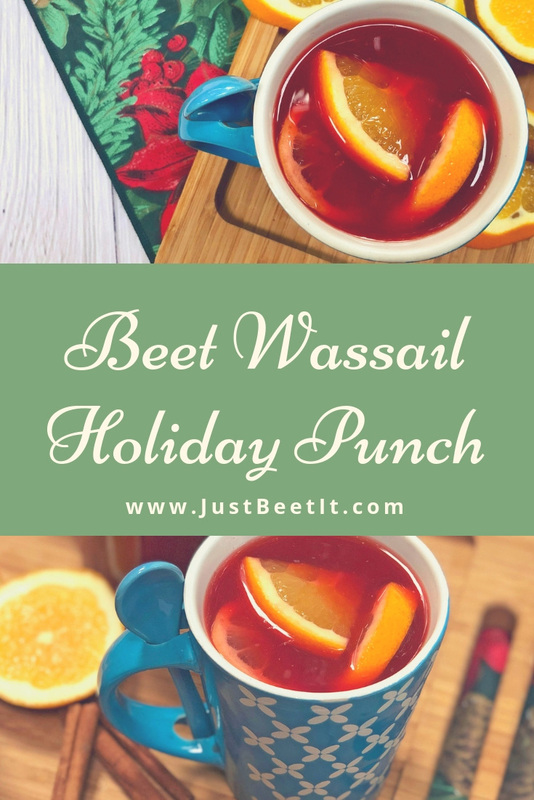 Beet Wassail doesn’t require added sugar because the juices are naturally sweet; however, if you prefer a sweeter drink, add honey or maple syrup to taste. This recipe is alcohol-free and family friendly, but you can also spike this beverage with aged rum, whiskey, or brandy for a boozy version. Often made in larger batches to share with social gatherings, wassail is best served in a crock-pot (slow-cooker) or punch bowl where guests can serve themselves. Wassail can also be ladled individually into mugs or glassware with handles. Get cozy with your favorite snuggle-bug by the fire, warm up your vocal chords for caroling, invite your friends over for board games and treats, or enjoy a family movie night and sip this exquisite holiday punch. Let’s go a-wassailing! *1 cup of beet juice offers a nice blend of flavors, but if you add an additional 1/2 cup, the delicious earthy beet flavor really shines! Most grocery stores carry ready-to-drink beet juice on the aisle with vegetable and fruit juices. If you can’t find beet juice in the stores, make your own beet juice by juicing beets. Combine all ingredients in a large pot and simmer for at least 20-30 minutes, or for more flavor, simmer for several hours in a slow-cooker. Strain into large punch bowl (to remove whole cloves) and serve hot or leave simmering in a slow-cooker available for guests to help themselves. Leave the sliced oranges and lemons along with the cinnamon sticks for more flavor and vibrant color. Planning a bigger party? Double or triple the ingredients! This delicious winter punch lasts several days in the fridge, and the flavors get more enhanced the longer it sits. After one day, you may want to remove the sliced oranges and lemons and replace them with new ones as they get quite mushy. The wassail color may change the longer it simmers or sits in the fridge. Cinnamon sticks often turn the vibrant reddish-colored punch into a brown (cider style) color. These photos were taken within an hour of simmering. Enjoy!